I was just a girl when the story of Isaiah’s vision in the temple first came alive for me, and it rocked my world. It took place the year King Uzziah died. I imagine everyone was sad, especially since his wicked son replaced him as king. We don’t know if Isaiah was in the temple that day as a matter of routine or because he was heartbroken and overwhelmed with grief at the loss of the good King Uzziah. Regardless, Isaiah entered the temple and had an up-close encounter with Almighty God, who was seated on His throne. It was a glorious sight when the train of His robe filled the temple. Seraphim flew around as they praised God and did His bidding. As soon as his confession left Isaiah’s mouth, God did something so remarkable I wonder why we don’t speak of it nonstop. He took Isaiah’s iniquity and guilt away with the touch of a burning coal from the altar, proclaimed him forgiven, and gave him a job to do. The sequence of events stuns me. Isaiah confessed and God forgave. Instantly, God put him to work. “Whom shall I send and who will go for Us?” Without a moment’s hesitation, Isaiah said, “Here am I. Send me.” (Isaiah 6:8) Just like that, Isaiah’s life took a quick segue to a deep and suffering place of service. I read those words as a girl and prayed, “Here am I, Lord. Send me.” For a long time, it looked as if God heard those words and said, “Sorry, kiddo. You’re not the one.” It took years to understand a different path from Isaiah’s is no less a surrendered path. August 15, 2016, I walked into Global Outreach and the second office on the left as an “appointed missionary.” In reality, though, I’d been a missionary for a long time because that’s how it works. We begin to serve and gradually it becomes a full-time lifestyle. Earlier this month, I was commissioned by the board of Global as a full-time missionary. It was just one more step on my journey of obedience. I expected to be a missionary to the digital world but it didn’t work out quite that way. First, I focused on prayer and the Untapped Power Grid was born. The program connects senior adults in long-term care facilities with missionaries in the field. Next, my heart went out to troubled teenagers. Eventually, I learned many of those teenagers had food insecurity issues and we began to provide supplemental food for the weekends. The problem of homelessness seemed too big to tackle so I started with one step. We made personal hygiene packs and gave them to those in need. It went from there, as it often does. Now, I help with everything from visiting the homeless to helping with items needed for re-housing them. There’s a lot of doing in my work, but it wouldn’t be worth a thing if there wasn’t “being” to go along with it. Lessons in Discipleship provides in-depth Bible studies in an in-your-place, at-your-pace format. Each study takes a tremendous amount of time to write because each one takes a tremendous amount of study. When you dive deep into the word of God, it changes you. I can’t write the study if I don’t allow the Bible to transform me first. That’s the being part. Hosea. James. Psalm 51. 1 John. If you want to study God’s word in a deeper way, these studies are for you. I almost left out the blog and my writing. That’s a huge part of my ministry and one I’ve sadly neglected the last few months, but I’m finally back. The internet makes it possible for my words to go literally around the world, but blogging at this level is not easy (or cheap). There are programs for social media scheduling, formatting and designing pins, emailing and managing courses, hosting the website and supporting the blog as well as courses to stay current on the latest trends. I haven’t mentioned the women’s retreats, frequent speaking, and mission trips (both domestic and international) but they’re a part of this ministry, too. My sending church, Hope Church Tupelo, asked me to take five minutes and tell about my ministry during a recent service. In preparation, I made a list of all my ongoing projects and realized something very important. I’m not woman enough to do this many projects. It’s a good thing we serve a mighty God who is more than able to handle it all. Many of you help support this ministry with your prayers, your hands-on assistance, your encouragement, and your financial support and I am deeply grateful for your partnership. Today is Giving Tuesday, a day when we turn our focus toward support of non-profits. Giving to those mission organizations proclaiming the good news of Jesus is a fitting beginning to what is often a hectic shopping season as we prepare to celebrate His birth. If you’ve been blessed by this ministry, I hope you’ll consider giving a one-time or ongoing donation to help continue the work. My ministry budget for this year is just under $22,000. It includes my salary of $310/month but not my living expenses. Those are separate and I handle them. (Missionaries are required to draw a salary of some amount.) You can donate online at our Global Outreach website or send your check or money order to Global Outreach, P.O. Box 1, Tupelo MS 38802. Be sure to put Account #4841 in the memo line. I’d be remiss if I didn’t remind us of an important truth. We’re all called to live and serve on mission, and I hope you’ll serve alongside me. There is much work to do and many hands are needed. As my pastor said recently, “When Jesus called us to follow, it wasn’t to watch Him stand still. 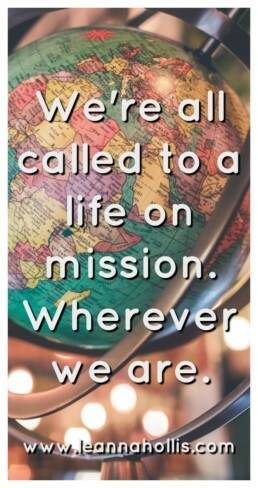 He was on the move, loving, sharing, serving, and we should be, too.” So, friends, what’s your mission? Comment below. I’d love to hear about how you serve.